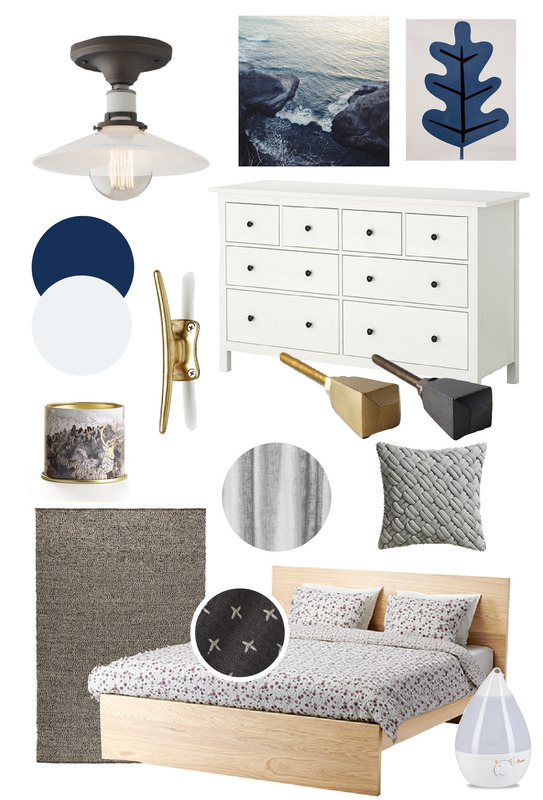 A while back, I shared a few moodboards for the bedroom which I created even further back. How much progress has been made on the bedroom? Basically none. Why? Simply not a priority. I regret most of all that we painted it these shades of blue. I like blue. It’s probably my favorite ‘color’, if I had to pick a color, but these colors depress me. I long for something airy to wake up to. Crisp white walls, crisp white bedding… Ah, to dream! Since this is one of the few rooms in the house that has two windows, it would seem wise to capitalize on that. The other problem: The bed is enormous. And it’s fully upholstered, making it attractive to the cat as a scratch post. It has an arched headboard, so we lose about 5.5 inches of useable space. It’s not a large bedroom, per se, and we’ve made it smaller by wedging in this huge bed. Because of the huge bed, we have these terrible, awful little rinky dink Ikea dressers. Four of them to be exact. They’re simply the worst. We need four because they’re so small. I have two and Alan has two. These are the cheapest dressers money can buy. The drawers are incredibly shallow, and get stuck, and they’re tacky and I hate them. Essentially, we have a very sad bedroom. 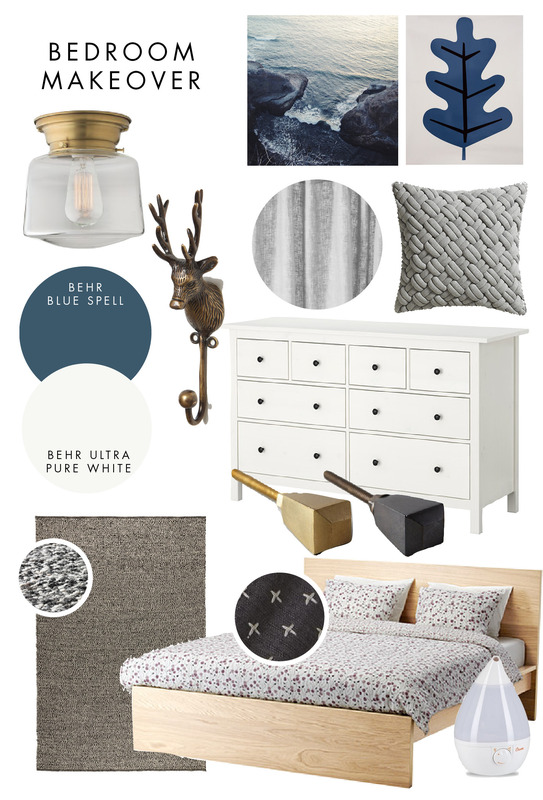 The bedroom should be a haven; a happy place! Instead I’ve been moaning for basically years now that I want a change. And, it’s not a priority. The bed is comfortable, even if it is ratty. And the dressers take up less space than something higher scale and more “grown up.” We don’t have overflowing dressers (but this is also because I obsessively cull my wardrobe on a regular basis). The walls are also depressingly bare, but I want to hold off putting any art up until we could paint the walls. So, this presents us with basically an All-or-Nothing Scenario: Redo the whole room, or don’t do any of it. To upgrade dressers we need to get the space between them and the bed back, so that means a new bed. If we’re replacing beds, we may as well paint the room, etc, etc, etc… I feel an urgency about pulling the trigger on this now, because I worry that once the baby comes, it will never get done. 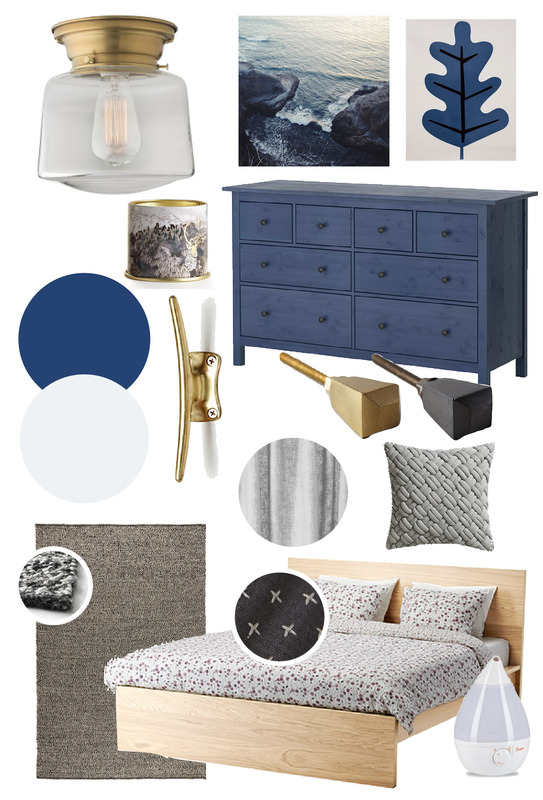 This meant of course I had to make a mood board. MMM, this fills me with joy and calm just to look at it. Very fresh, yes? It has a similar lightness to the plans for the baby’s room. This Max Wanger print is the epitome of calm, and I love the sunset gradient. Some of my favorite vibes are here in this picture. His prints are however prohibitively expensive (especially if you want something framed). I could probably just as easy get one of my own photos blown up and cheaply framed. But a huge photo of a scenic vista seems like the perfect thing to see first thing in the morning, doesn’t it? WHO KNEW Urban Outfitters had so many amazing area rugs? And for cheap? I didn’t until today. Love that you can get a huge one for 200 bucks. Low pile is probably smartest for us too because Arya sheds like crazy, and the easier to clean, the better. A beautiful, simple dresser is what we so badly need. But to find the right one, it wasn’t enough to just take measurements and see if it would fit in the space. I took the dimensions of each drawer, to see how much more space we could theoretically use compared to our terrible little IKEA dressers. The answer was quite a lot. We could ditch the 4 little ones for 1 beautiful big one, no problem. Worth the investment, period. Let’s just get those walls nice and white. I’ve looked at all kinds of patterned duvet covers over the years, but I have to say I really love the simplicity of this set from IKEA. We have a pair of desk lamps from Target serving as bedside lighting right now, and they’re perfectly nice lamps, but they don’t give off much light (and their bases take up a lot of room). I like the idea of mounting some RANARPs so the light is a little higher up, and spreads a little farther. Plus, that frees up table space on the nightstand. More room for half-empty LaCroix cans and books and my phone. For curtains, something simple and easy. Finally, a nice bed that matches the dresser, matches the wood tones in the house, and crucially, gives us back 8 inches of space. Some of that space would be filled in by the larger dresser, but it’s a net gain of about 4 inches I think. Not bad! I think we may actually pull the trigger on this plan, guys. I’ll keep you updated.